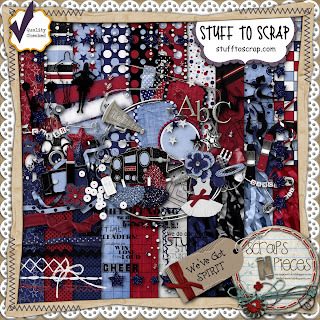 I've been a busy digi-scrapper over the last week. I'm trying to stay caught up as much as I can between the kids, my hubby's schedule, house stuff, oh...and work...not to mention feeling a little lousy for a few days. I actually made it to two speed scraps this past week. Shocking. A few us CTs have been discussing in the STS forum how we keep organized. I'm willing to try anything and everything. I'll download it either on my phone or computer. If I don't like it, I'll uninstall. I think I've found something I love. I had used my Outlook task list, but was finding it to be limiting. Someone suggested Evernote. It's amazing, and I highly recommend it. Now...onto what I've created lately. 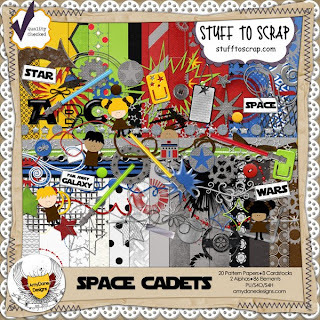 Earlier this month, AmyDane Designs released the full-kit Space Cadets. This kit so fits my life between my big-kid husband who is obsessed with everything Star Wars to our oldest son who is following in his dad's footsteps. They've now released a wonderful Building Block add-on for all those Star Wars Legos fans. I will be using this kit and add-on a lot. 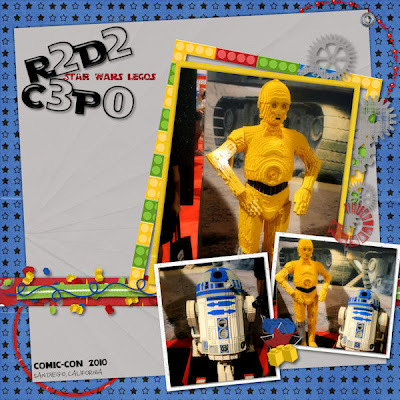 The first page I created (for the August Template Challenge) shows off the Star Wars Lego display at Comic-Con in San Diego back in 2010. We had a blast. 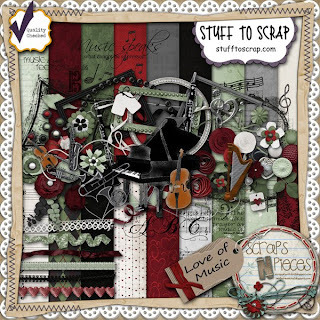 Don't forget, AmyDane Designs now sells their products at the newly opened Scraps N' Pieces store and at My Memories. This next layout, I created for the August Color Challenge. 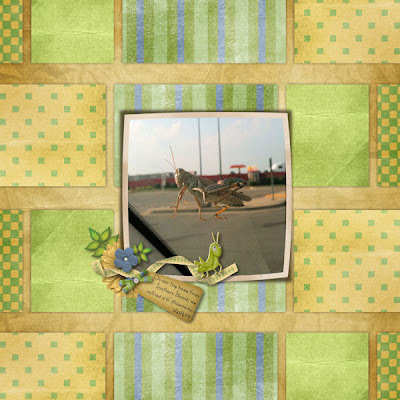 I originally created a template, but in case that didn't count...I used one of the other submissions - Summer Afternoon by Scrapteam2008. This little (well, not so little) grasshopper hung out on our windshield as we stopped by snacks on our way home from visiting family. He last about 1/2 a mile down the interstate. The picture sort of looks like he's this monster insect taking over the McDonald's parking lot. The bad part of being caught up on weekly challenges early is, you have all week to wait for the next word (word of the week), challenge (challenge of the week), next designer of the week. So, I kept refreshing the forum today for the next "of the week", and luckily the WoW popped up. Summertime is the next word, and here's what I came up with. I knew I still had A LOT of 4th of July pics to scrap. I also love to use kits that are intended for a certain theme or purpose, but use them for something else. 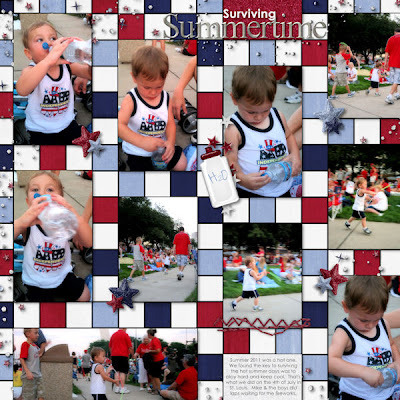 So, I picked We've Got Spirit by Scraps N' Pieces to create this page about how we kept busy before fireworks and stayed cool in the process. Last week's (or this past week's) Challenge of the Week asked us to do something with the word blue, but not necessarily about the color. 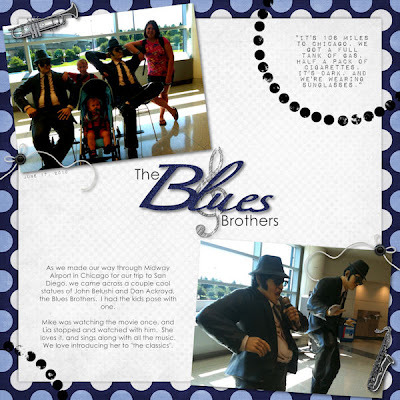 I knew right away I still hadn't scrapped pics of the kids posing with the Blues Brothers statues at Midway Airport on our way to San Diego last summer. 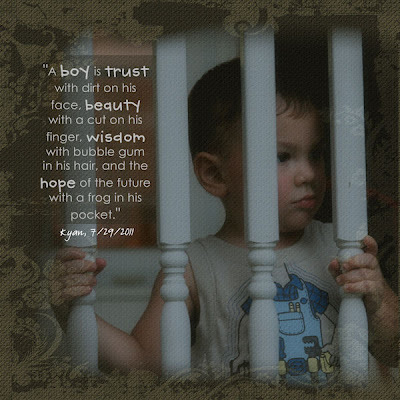 I used a little from We've Got Spirit and mostly used the kit Love of Music, both from Scraps N' Pieces. 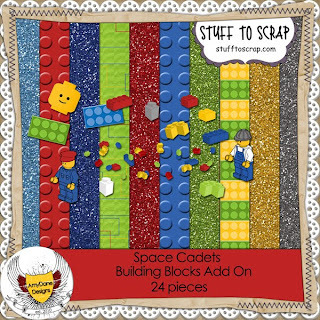 Don't forget, Scraps N' Pieces now sells their products at the newly opened Scraps N' Pieces store and at My Memories. We've finished up the third week of Featured Designer Challenge. It was monthly, but now weekly. 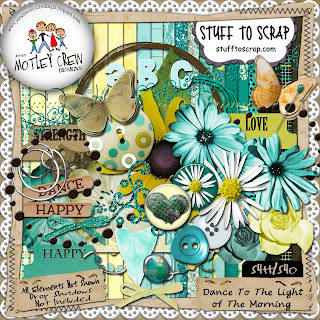 This past week's designer was Jensen Motley Crew Designs, and I used a paper from Dance to the Light of Morning. I kept it simple with just one picture, one paper, and a word art.